Kick off your visit on the 16th (Sat): see the sky in a new way at Denver Museum of Nature & Science, meet the residents at Denver Zoo, and then admire the natural beauty at Denver Botanic Gardens. Before you visit Denver, use our trip planner to discover what you can do and see there. The Route module shows you travel options from your home to Denver. In February, daily temperatures in Denver can reach 45°F, while at night they dip to 21°F. Cap off your sightseeing on the 16th (Sat) early enough to catcht the bus to Colorado Springs. 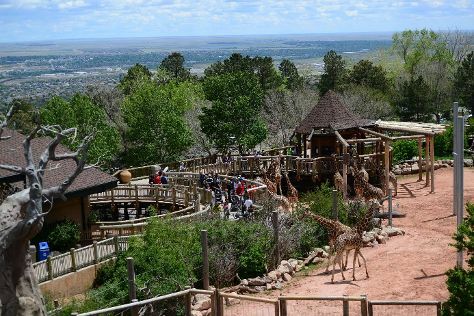 Start off your visit on the 17th (Sun): meet the residents at Cheyenne Mountain Zoo, then tour the pleasant surroundings at Garden of the Gods, and then have some family-friendly fun at Battlefield Colorado. For other places to visit, ratings, reviews, and other tourist information, refer to the Colorado Springs holiday maker site . You can take a bus from Denver to Colorado Springs in an hour. Alternatively, you can drive; or fly. In February, daytime highs in Colorado Springs are 46°F, while nighttime lows are 21°F. Wrap up your sightseeing on the 17th (Sun) early enough to drive to Vail. Start off your visit on the 18th (Mon): take a pleasant ride with a tour on horseback and then grab your bike and head to Vail Mountain Resort. To find maps, other places to visit, photos, and other tourist information, go to the Vail online route maker . Getting from Colorado Springs to Vail by car takes about 3 hours. Other options: take a bus; or do a combination of flight and shuttle. While traveling from Colorado Springs, expect cooler days and slightly colder nights in Vail, ranging from highs of 26°F to lows of 15°F. Finish your sightseeing early on the 18th (Mon) so you can drive back home.